2011. Pen & ink. 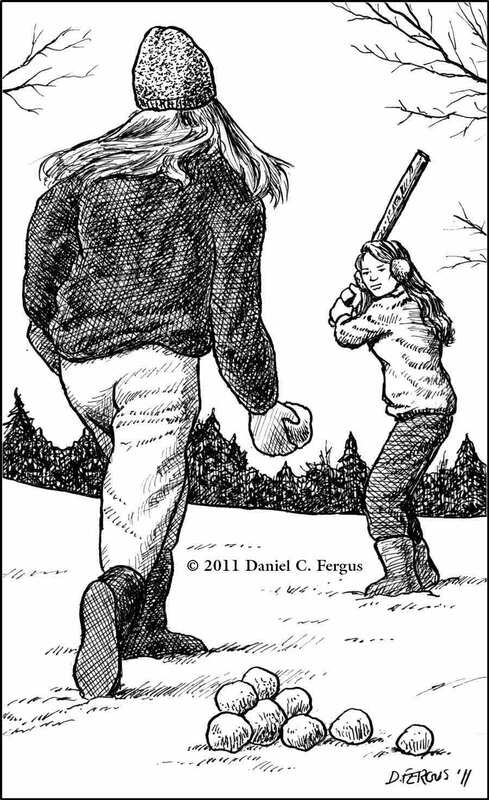 5¼ " x 9"
My daughters loved playing softball. In 2011 Rachel starred on her high school team and Ellie was a starter on her middle-school team. Back then they probably would have played softball year-round if our weather had allowed for it. Given this, their enthusiasm for the sport seemed a natural subject for the family’s 2011 Christmas card. All images and work shown on this site copyright © 1985–2018 Daniel C. Fergus unless otherwise noted. All rights reserved. No reproduction without permission.